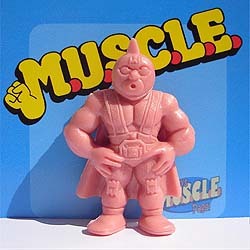 MUSCLE were these little pink rubber wrestling toys that took over the school playground like wildfire! Honestly, these things were hot, hot, HOT!! It was the perfect toy in many ways. They were fun. They were interesting. They were small enough to carry with you everywhere. 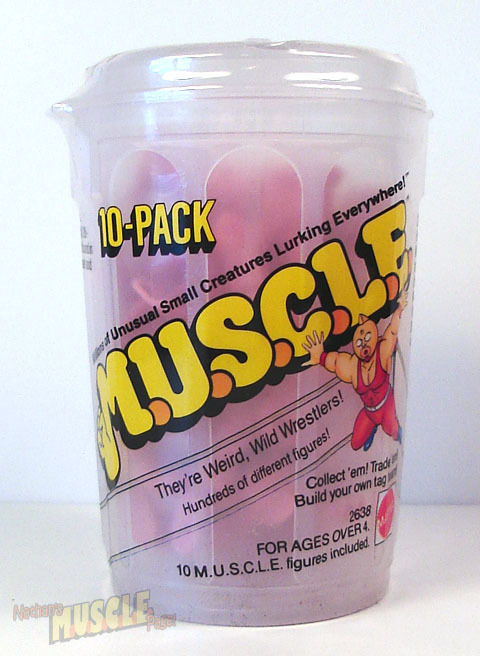 And the way they were randomly packaged made it so that you were forced into the MUSCLE trading game when ever you got a double. It even says it on the packaging. Trade ’em! And trade ’em we did. I remember one trade where the other kid wanted this “stronger” character I had, but I was more interested in the smaller, more “interesting” looking character he had. The trade seemed fair, and we both went along our merry way with our brand new MUSCLE. For a while the four pack on blue cardstock seemed to be the only way to get these toys, until one day in school the coolest kid on the planet walked in with what could only be described as the greatest moment in history since Moses parted the Red Sea: He introduce the MUSCLE 10-Pack plastic container to everyone. These things where a little hard to find in my area, which made these an absolute gem when I did happen to come across them. But unlike the blue cardstock pack, these MUSCLE came in a translucent packaging, so you had NO idea which figures you were getting. What if half the container was full of doubles? Better get two just in case. Unfortunately, MUSCLE seemed to vanish almost overnight. It wasn’t due to lack of popularity, that’s for sure. It was a toy version of trading Garbage Pail Kid cards, and kids LOVE to trade anything and everything. No, sadly the toy faded away due to some strange licensing agreements Mattle had which kept them from making as much money as they could have during a rough financial time when video games were taking most of the toy sales away. 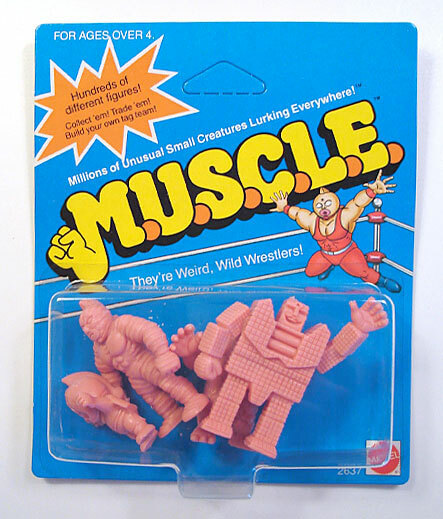 MUSCLE were more than just a great toy, they were the catalyst to a type of social interaction that started the moment we ripped open that pack and became part of a larger MUSCLE tribe of traders and collectors. pretty sure they got a show in the early 2000s. it was pretty funny.